Guitar tuners are a must have for guitarists. But with so many options, how do you choose the best? 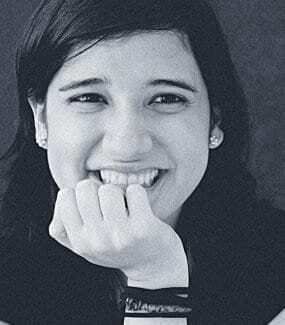 We did it for you. Find the best guitar tuners here. 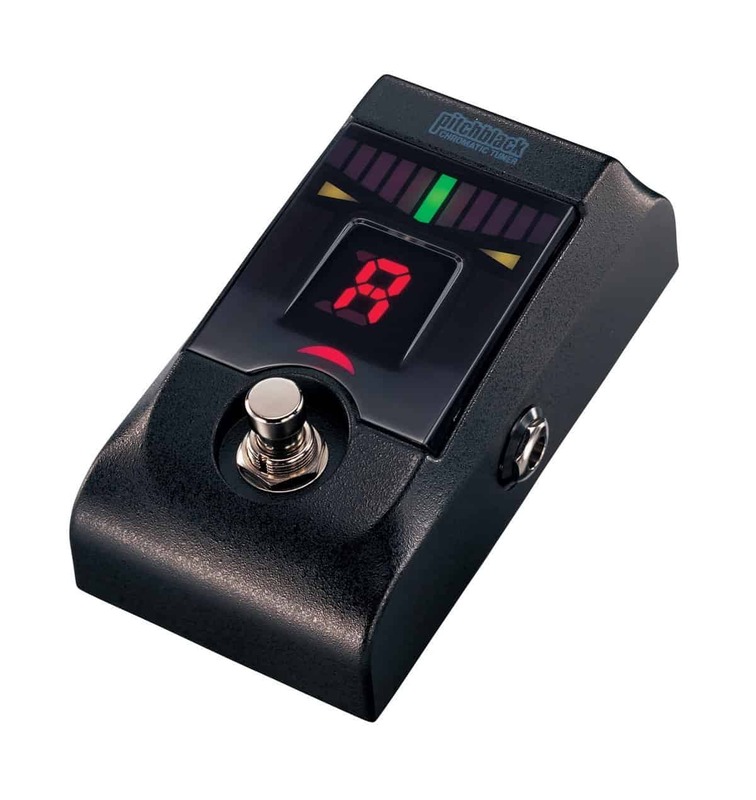 This chromatic tuner foot pedal has a wide frequency range and multiple operating modes for accurate and fast on-stage tuning. 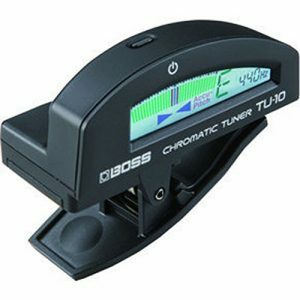 The clear and colorful display and easy adjustment give this tuner high marks for usability. This compact and affordable pedal tuner is perfect for professionals on a budget. 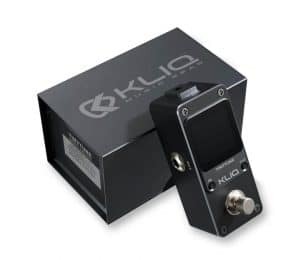 One of the best guitar tuners for players on a budget, this affordable Kliq clip-on model is also easy to read and use. 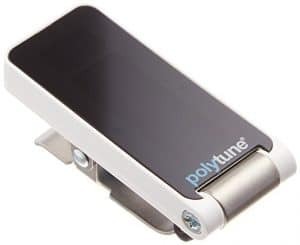 If you want polyphonic tuning but don’t have space for more pedals, the PolyTune Clip gives you the option in a well-designed clip-on package. This smart device automatically tunes your guitar, but that convenience comes at a pretty steep price. 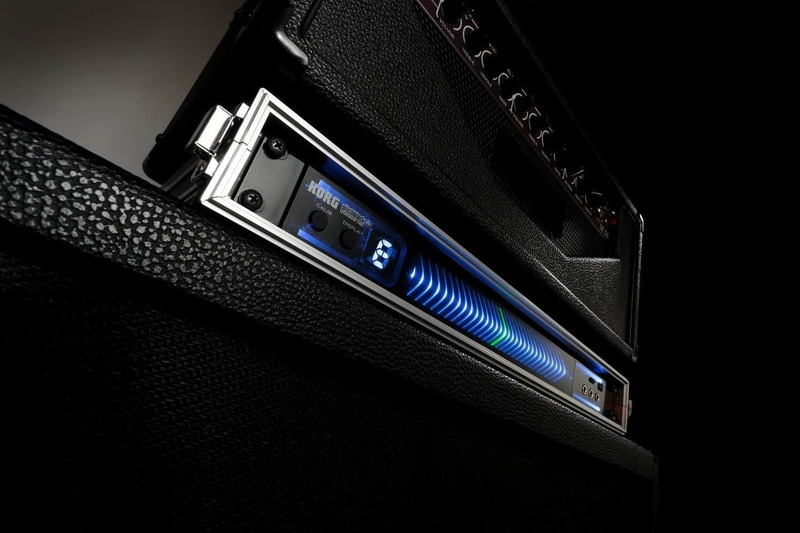 A beautiful and surprisingly light-weight rack-mounted tuner that’s equally at home on-stage or in the studio. It’s easier for most musicians to think of frequency ranges in terms of pitches. The standardized vocabulary to express true pitch across instruments is to use the note name followed by the octave in which it falls on an 88-key piano (e.g. A0 or C8). You’ll mainly need to focus on this if you plan to also use the tuner for bass since some cheaper tuners can’t pick up the lowest octave. 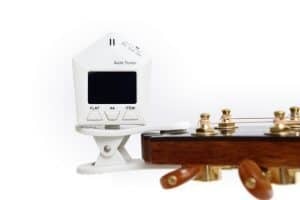 A clip-on or hand-held tuner will be more useful if you play acoustic instruments, something to consider if you like to incorporate other stringed instruments like ukulele or mandolin into your sets. Many stompbox tuners have an added benefit beyond just tuning. They can sometimes provide power to other pedals that come after them in your rig, letting you utilize your rack more efficiently. 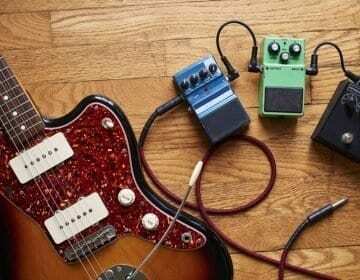 If you tend to use a lot of effects pedals, this can be a very helpful side benefit. 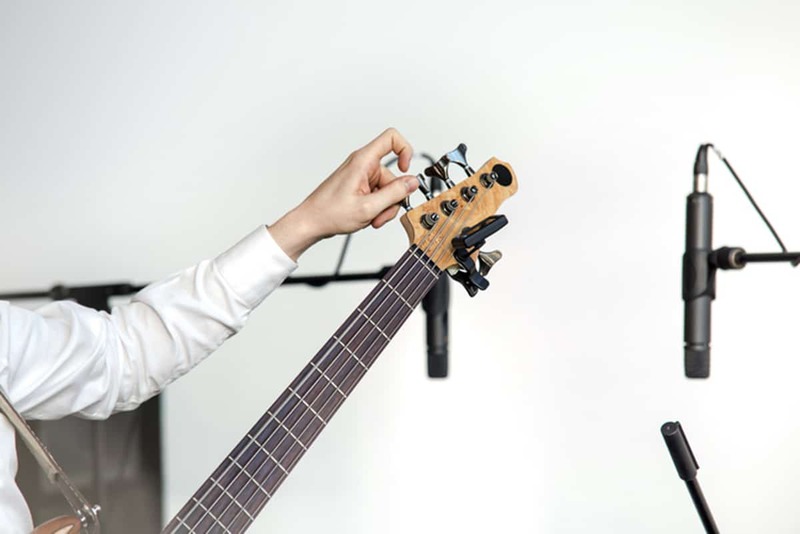 Some hand-held tuners do offer you the option of plugging your instrument directly into the device, which is helpful if you want a tuner that can work with a wide array of instruments but still gives you the truest possible reading. Even the best guitar will only sound great if you can get it in tune with the rest of your band—and with itself. Professionals can train their ears to detect shifts in intonation, but that won’t help so much in a loud club, and won’t guarantee accuracy. This makes a high-quality tuner a must-have accessory for any serious musician. It's so important. 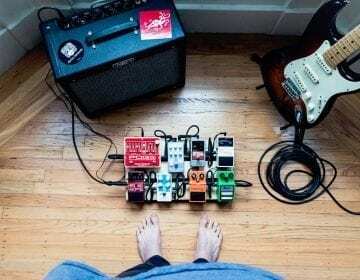 Unfortunately, choosing the ideal tuner for your needs is no easy task, since the best guitar tuners don’t necessarily take one form or another, though certain players do have their preferences. Tuners didn’t make it on this list based on just one factor. Accuracy within one cent or less is the first thing you should look for. 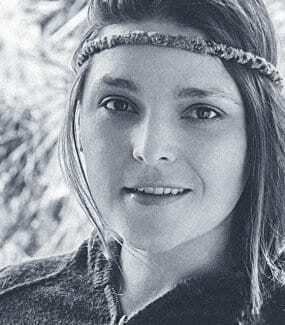 it becomes a question of your own needs. For a gigging musician, durability is a big concern, especially in a stompbox. If you’re on a budget, affordable hand-held options like the KLIQ UberTuner can still get the job done. You can break the options listed above into four general categories: hand-held tuners, clip-on tuners, stompboxes, and rack-mounted tuners. 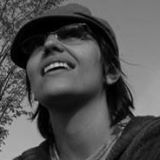 Each of these types has its own advantages and weaknesses. Figuring out which type of tuner you’re looking for should be the first step when you start your search. How the tuner “hears” your instrument will have an impact on the accuracy of the reading, as well. Hand-held tuners (and smartphone tuners, like the Roadie 2) use a microphone to pick up the sound your strings produce and determine whether it’s sharp or flat. This can be less effective in a loud environment, where the microphone has a more difficult time detecting the specific vibrations of your instrument. A clip-on tuner reads the vibrations of your instrument directly, giving you a true picture of your sound. The same is true of stompbox and rack-mounted options, which use a direct line of your signal to process the sound and determine its pitch. These are arguably better options if you want to make sure you’re getting the truest readings possible. Boss’s TU series are the best-selling stage tuners worldwide. The TU-3 is the latest entry in the series and has made improvements over even the traditionally powerful features of the previous options. If you’re looking for the comprehensive option in pedal tuners, this Boss model is one you need to look into. The screen is the biggest improvement over previous models. Most LED displays are great for indoor or night-time use but are difficult to read during outdoor performances in bright light. The high-brightness mode they’ve added to the TU-3 gives you glare-free visibility of your tuner’s screen in every situation. The TU-3 has two performance modes. It behaves like any other tuner when it’s in Chromatic mode, but it also has a specific Guitar/Bass mode that gives you the option of tuning by string number. It supports less traditional tunings, like 6-string basses and 7-string guitars. In Guitar Flat mode, you can even check your intonation on drop tunings. The TU-3 automatically mutes the sound whenever you toggle the tuner on, letting you adjust your intonation without the audience listening in. It’s a bit on the pricey side, but the TU-3 is worth it if you’re looking for a feature-rich tuner that can reliably serve you through years of gigs. The original PolyTune was the first polyphonic tuner to become widely used, and the PolyTune 2 builds on that tradition. Its main selling point is the fact that it lets you tune all your strings at once. Just strum and the PolyTune will tell you which strings need to be adjusted. This lets you tune more quickly so you can get back to playing. The PolyTune 2 uses an ambient light sensor and adjusts the brightness of the screen accordingly, letting you use it just as well in any environment without any hassle. They also added a strobe mode, which was missing from the PolyTune, giving you more precision so you can fine-tune your guitar. This also might just be the smartest pedal you’ll find for any purpose. Along with the automatic brightness display, it also gives you the MonoPoly option, which instantly recognizes how many strings you’re playing and responds accordingly. 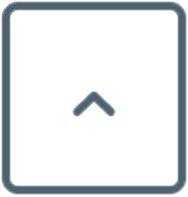 It also automatically stores all of your preferences, including what mode you prefer, so you don’t have to adjust it again every time you use it. Whether you’re looking for speed, accuracy, or easy usability, this pedal does it all. If you’re looking for a great hand-held tuner option, the MetroPitch is a versatile 3-in-1 device that fits right into pretty much any guitar case. 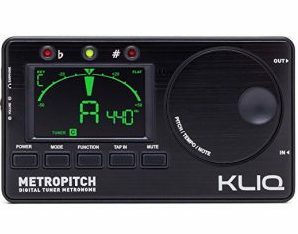 In addition to the tuner, the MetroPitch includes a metronome and a tone generator, making it a great tool for the practice room. 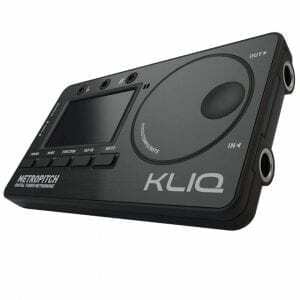 The MetroPitch gives you similar performance to other high-end tuners. 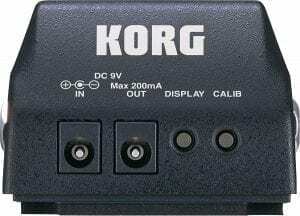 It has a wide frequency response range and takes quick, accurate readings. The biggest difference from the others? Kliq shrunk the display to make room for a pitch and tempo selection wheel, which makes it much faster to change your settings. One of the most appealing things about the MetroPitch is its versatility. It has tuning pre-sets for a lot of different instruments, including not just guitar and bass but also popular doubling options like ukulele. This can be especially helpful if you pick up a new instrument and are still getting used to it. It even has transposition options so you can pass it around to the horn players in your band. The design of this Boss clip-on is its best feature. It has a unique curved casing that’s both attractive and compact. Not to mention it’s built to withstand the abuses of daily use on the road. The Accu-pitch indicator gives you a clear red arrow showing which way you need to adjust your pitch, on a true color LCD screen that’s overall more visible. The simplicity of this tuner makes it very easy to use. While it doesn’t offer as many modes or features as some of the pricier options, that also means there’s nothing to set up before you can start using it. It’s a reliable option that you can throw into the gig bag of any stringed instrument for instant, accurate performance every time. While it might not be feature-rich, the TU10 does give you the option of calibrating to a different pitch center. It also has an auto-shutoff option, which saves you battery life. That’s especially nice if you have a tendency to forget to turn your tuner off before putting it in your case. Features BOSS quality giving you reliability in a clip-on tuner. 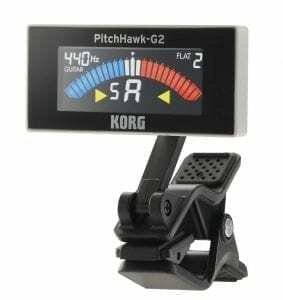 This pedal tuner from Korg is a great option for keeping your intonation locked in during on-stage performance and is one of the most affordable options you’ll find for a full-sized pedal tuner. Its large LED display is easy to read, even in low light, and it gives you a true bypass so there’s no impact on your tone. The Pitchblack is designed for gigging musicians. 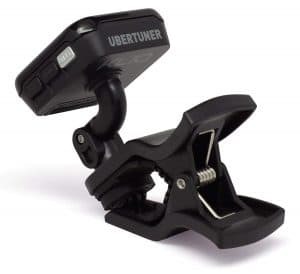 It fits easily on any pedal rack and can be connected in any position between your pedals without changing the sound of your effects. It offers four different modes for different situations. Mirror mode is the most unique, giving you a better idea of whether your strings are in tune with each other. In terms of calibration, the Pitchblack lets you adjust the pitch center within five cents sharp or flat of A440. It also has a broad detection range, from E0 all the way up to C8, so it’s equally suitable for a guitar or a bass. The die-cast aluminum casing is plenty sturdy, too, making this your most reliable option for an on-stage tuner. A clip-on tuner is many players’ favorite option for quick hands-free intonation checks, both during gigs and in the practice room. The first thing you’ll notice about the PitchHawk is it's easy to read display. 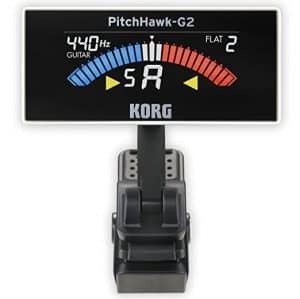 It’s brighter than previous Korg tuner models and uses a color-coded system (red for sharp, blue for flat) so it’s easier to track your pitch at a glance. We found that really useful. 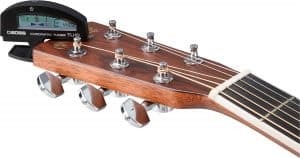 The G2 is built with a slimmer profile than most clip-on tuners, which makes it easier to position securely on a wider range of instrument styles and sizes. Korg has also made improvements to the clip itself so it gets a stronger hold. Along with guitar and bass modes, the PitchHawk also has settings for drop tunings and capo users. You can save your calibration and tuning settings, too, so you don’t have to waste time adjusting the tuner every time you turn it on. This is by far the most affordable pedal-style guitar tuner you’ll find and has a compact design that fits easily on any rig. It doesn’t have the same array of modes and features as some of the pricier pedals above. But if you just want a simple, accurate tuner, it will get the job done—and for a lot less money. Accuracy is arguably the most important attribute of a tuner. It responds quickly with a reading that’s guaranteed to be within .5 cents of the pitch center. It can detect pitches as low as A0 and as high as C8, and gives you a wider calibration range than many tuners, up to 10 cents sharp or flat of A440. It can even accommodate drop tuning of up to four semi-tones. The casing isn’t just compact, it’s also incredibly durable, constructed entirely of high-quality aluminum. The colorful display doesn’t rely exclusively on LED lights for visibility, which makes it easier to read in any light conditions. If you’re on a budget and want to find the best value, Kliq’s UberTuner gives you accurate, easy operation for less than twenty bucks. 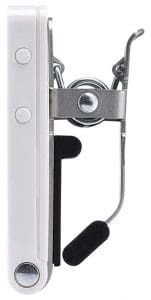 It doesn’t feel cheap, either, with a strong, sturdy clip that’s attached securely to the adjustable display. The UberTuner uses a black background on the display to enhance the contrast and makes it easier to read, even from a slight distance. There are three different settings for the angle of the display, letting you tweak it to suit your instrument and playing position. The performance is impressive, too, especially for the price. 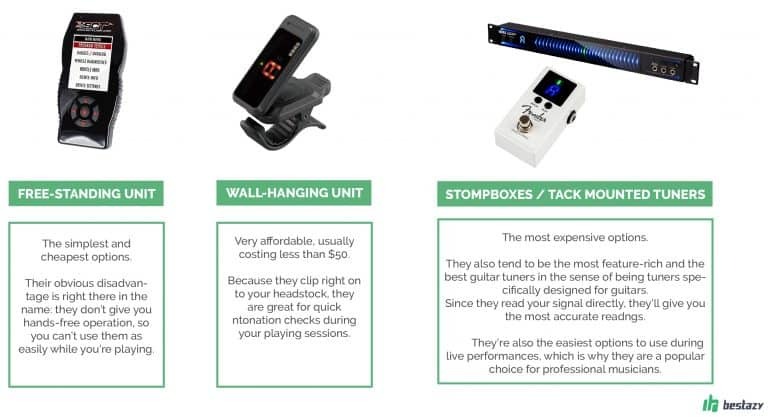 The response time is even faster than with some costlier tuners, and it’s accurate within 1 cent—not as tight as some of the higher-end tuners on this list, but great for the price. You even get five different tuning modes, with an all-purpose chromatic option as well as settings for guitar, bass, ukulele, or violin. 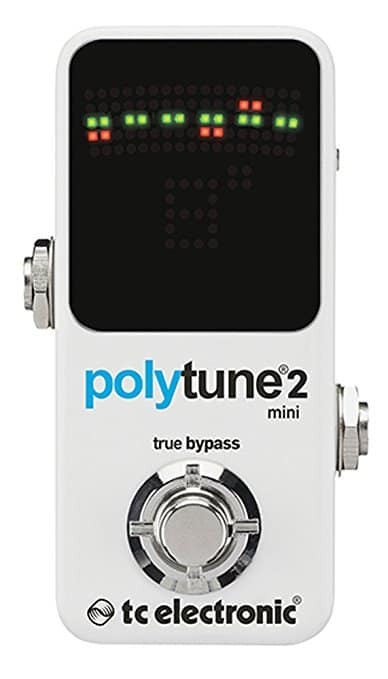 This more compact version of the PolyTune 2 above brings you the same fast and accurate performance but in a convenient clip-on size. It’s hands down the most appealing option for a polyphonic tuner in a clip-on form, letting you check the intonation of all your strings at once without adding another pedal to your rack. 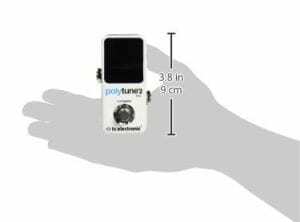 Like other PolyTune models, this tuner gives you the option of playing in most common alternate tunings and lets you save your tuning settings for easy future reference. There are two modes of operation (chromatic and stroboscopic) that offer up to .02 cents of accuracy. The LED display is large and bright. The multi-string display can be a bit confusing at first, but it’s clear and easy to read once you get used to it. It also senses which way is up and adjusts automatically, meaning left-handed players can just flip it around. 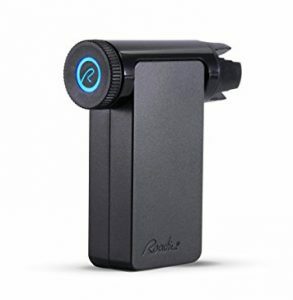 The Roadie Standalone tuner is an innovative product that integrates with your smartphone to tune your instrument to the exact pitch automatically. The Roadie app on your phone makes all the pitch decisions. It’s accurate and lets you choose from a range of popular tunings, with options for a range of string instruments from guitar to banjo to violin. It’s also very easy to use. Open the app, put the Roadie over a tuning peg, and pluck the string. The Roadie will do all the work. The app itself is as responsive as any tuner on this list and accurate within tenths of a cent. You will be relying on your phone’s microphone to capture your tone, however. Make sure you have a phone that’s up to the task or else be prepared to fine-tune it by hand. While it’s easy to use, it’s not necessarily quick to use for small adjustments since it needs to be placed on each tuning peg individually. Where it’s most useful is in changing quickly from one tuning to another, automating the process so you can move seamlessly from one tune to the next through your set. 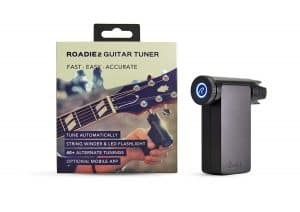 If you frequently switch between instruments or use alternate tunings, the convenience of the Roadie is well worth the price. If not, you can get similar accuracy and performance for a lot less from other options on this list. Korg has been making professional-level rack-mounted tuners since the 1980s, and the Pitchblack Pro is just the latest iteration of their design. For a rack-mounted design, it’s very lightweight with a slim profile that means it’s not limited to use on a rack, making it a very versatile piece of professional equipment. 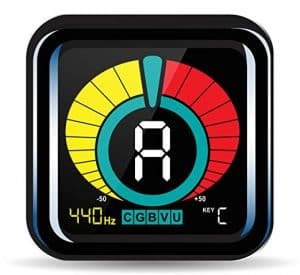 The display of this tuner uses a 3D lighted meter. Along with giving you easy to read and accurate information about your pitch, it’s pretty cool to look at, too, with an overall sleek and beautiful design. The included rack mounting brackets are very convenient, though they’re made of plastic so you’ll have to be a bit more careful with them than you would be with metal hardware. But they don't stop there. In terms of features, it gives you everything you’ll need from a professional tuner, including both strobe and chromatic operation and a frequency range of E0 to C8. It’s on par in terms of accuracy and speed with the Pitchblack pedal tuner, making it another excellent contender in that price range. As you’ve probably noticed, guitarists have a few more options than most when it comes to the form the tuner can take. In addition to the standard hand-held models you’ll see being used by musicians the world over, clip-on tuners, pedal tuners, and even rack-mounted boxes are options, as well. The sheer amount of options out there can make shopping for a new tuner difficult. That’s why we’ve searched the web for you to find what we consider to be the best guitar tuners on the market. whatever your budget and playing style, we’re confident you’ll find something on the list above to suit your needs. Here are some reviews of our favorite guitars under $500. But while we still have you here, don’t forget to pay special attention to the two tuners below. 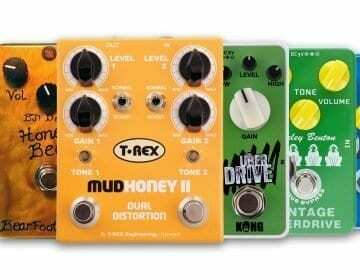 They were our top selections among all the pedals we tried. 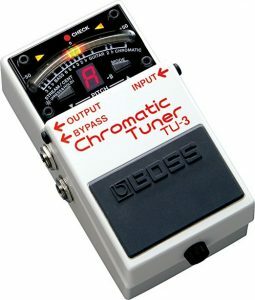 We found the Boss TU3 pedal tuner is the best overall option for the gigging guitarist. That’s thanks in part to it’s outstanding accuracy, screen readability, and the all the other features this pedal packs in. Guitarists, bassist, and ukulele strummers will all find the MetroPitch useful when tuning their instruments. That versatility, along with the its affordability and transposition options push this one over the top. Do yourself a favor and give it a try! Of course, it’s not uncommon for players to have a whole slew of tuners for different instruments and situations. Tell us below if you have a favorite option either on the stage or in the practice room. Even if that option is your own ears! What’s the difference between chromatic mode and guitar mode? 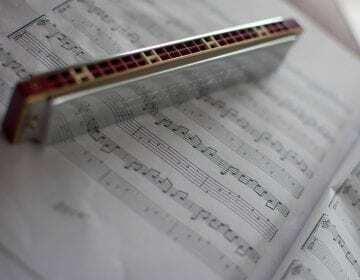 When the tuner’s in chromatic mode, it will simply detect what pitch you’re playing and display that on the screen, along with whether it’s sharp or flat. When you put it into a specific instrument’s mode, it instead knows exactly what pitch each string is supposed to be tuned to and gives you adjustment recommendations based on that. When you calibrate a tuner, you change what frequency it considers to be on pitch for each note. 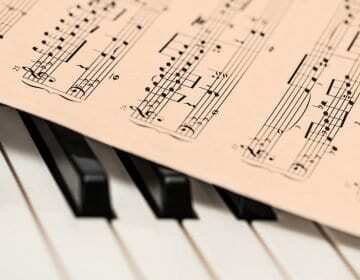 The general standard is A440, which means that A4 has a frequency of 440 Hz. Changing the calibration makes subtle changes to your overall sound. A higher calibration will sound brighter, while a lower can sound warmer. This can also let you change your pitch center to accommodate habitually out of tune band-mates. Will a pedal tuner affect the sound of my other effects? This depends on the pedal. If the pedal has a true bypass, this means that the signal passes through unaffected when the tuner isn’t in use. In this case, there should be no change in your effects, no matter where you place them in relation to the tuner. 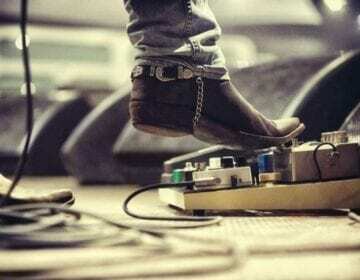 Other pedals will have a slight buffering effect on your sound. Some players like this, since it can smooth out your tone and almost act like an EQ, but if you want your sound unaffected a true bypass is the way to go.